Charles H. Chapman, Jr. was born on August 19, 1918 in Logan, WV. He was the eldest child of Charles H. Chapman, Sr. and Jeanette (Mitchell) Chapman. He graduated high school and completed two years of college and was a fireman. On April 25, 1941 he enlisted in the U. S. Army at Fort Hayes, Ohio as an air corps cadet serial number 15018962. After completing flight training as a fighter pilot, he was assigned to the 8th Fighter Group, 36th Fighter Squadron. Built by Bell in Buffalo, New York at a cost of $47,842.00 using funds F-1 for Army Air Force Order Number W535-ac-15675. Delivered to the U.S. Army on January 12, 1942. On April 15, 1942 control officer ST-70006-B transfer account to PO, Army Aircraft at Wright Field. Disassembled and shipped overseas to Australia and reassembled. Assigned to the 5th Air Force, 8th Fighter Group, 36th Fighter Squadron. No known nickname or nose art. On May 18, 1942 P-39 and P-400 Airacobras from the 36th and 35th Fighter Squadron plus attached aircraft from the 39th Fighter Squadron and 40th Fighter Squadron took off from Port Moresby intercept an incoming formation of Japanese G4M1 Betty bombers escorted by A6M2 Zeros. The precise number of Airacobras involved in the scramble is unclear, but was either thirty-two (24 P-39s and 8 P-400) or only twenty-nine. P-39F 41-7191 piloted by 2nd Lt Charles H. Chapman, Jr. took off from 7 Mile Drome near Port Moresby. After the Bettys dropped their bombs over 7 Mile Drome, the Airacobras intercepted and shot down G4M1 Betty piloted by Oyama and damaged several others. Chapman was last seen at approximately 9:15am engaging the bombers. When he failed to return, he was officially declared Missing In Action (MIA). His aircraft was officially condemned the day of the mission. Afterwards, another Airacobra reported observing an Airacobra believed to be Chapman's plane might have collided with this Betty and may have exploded and disintegrated in mid air. Chapman was officially declared dead the day of the mission. He is memorialized on the tablets of the missing at Manila American Cemetery and still listed as Missing In Action (MIA). 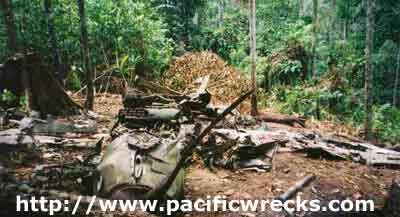 During 2001, a Malaysian logging company cleared a road on a ridge line in the Brown River area resulting in the discovery of this crash site. This aircraft was initially investigated by wreck tec Wilkenson Egimbari and visited by John Douglas. This Airacobra appeared to have pancaked into the ground in a flat spin, landing largely intact. The tail section was largely intact with large digits painted in yellow. The left side had "17" and the right "91" indicating the last two digits of the U. S. Army serial number. The aircraft had the U. S. star on the wing. On the left side of the cockpit was the model and serial number: P-39F-1-BE Serial Number 41-7191, confirming the identity of the plane. During their initial investigation, neither cockpit door was found and no trace of the pilot was found indicating the possibility he might have bailed out. "The plane had apparently flat spun into the hillside and had a badly squashed appearance to it; as if a giant had trod on it. It had not entered nose first, as is quite common for most aircraft wrecks. The propeller was quite straight, as well as the surrounding front covers. The plane was obviously American, as the white stars on the wings attested, and some large yellow faded numbers still existed on the tail. 17 on the one side and 91 on the other. More numbers were stenciled on the side panels near the front and the serial No. gradually emerged after careful examination: 41-7191. 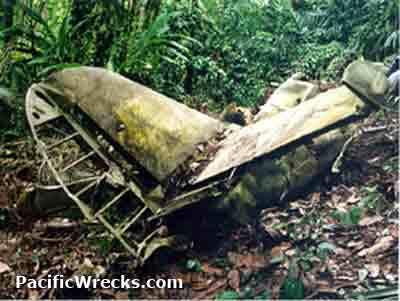 Only one engine was present and the fuselage stencils proclaimed it to be a P39F." That same year, US Army CILHI contractor Brian Bennett visited the crash site with John Douglas. During 2001, the tail section, machine guns, control stick and gun sight were recovered by Robert Greinert / HARS and transported by truck to the PNG Museum where they were stored awaiting export to Australia. Instead, the tail section (and possibly other salvaged parts) were containered by 75 Squadron and exported to Australia. Today, the whereabouts of the wreckage is unknown, but presumed to be stored on the property owned by Bruno Carnovale near Melbourne. 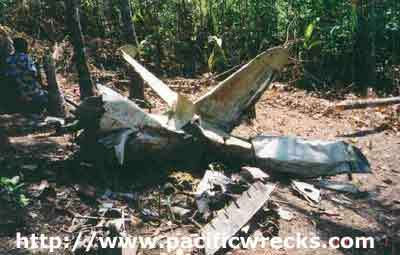 During 2003, a team from JPAC surveyed the aircraft and coded the crash site "JPAC incident 133". 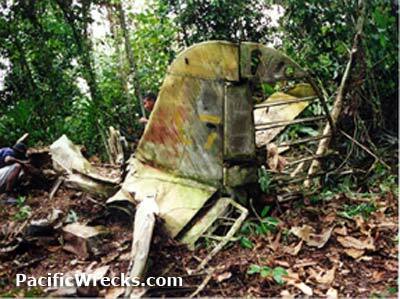 "Although the tail and guns were missing, this Airacobra was still an impressive wreck site. The landowner told us he was never paid for the parts salvaged. Instead the salvager told him: 'Talk to your government for payment'. Now, the land owners hope to encourage tourism to this easily accessible site." During 2012, a team from JPAC visited the crash site and conducted a thirty day recovery mission to search for the pilot's remains. During their investigation, nearly the entire aircraft was moved further down the hillside, leaving only the nose section and engine in situ. "My name is Madeline Young and I am the daughter of Mr. Dana Webster Young, the second cousin of 2nd Lt. Charles H. Chapman, Jr. My father vaguely remembers someone having spoken about Chapman but he was very young. He does remember Chapman's brother, they called Mitch short for Mitchell. My father rarely visited the Chapman family although he was very close with his grandmother Adrienne. Adrienne had several brothers and sisters Mabel, Margaret, Willa, John Chapman (Chapman's father and my dad believes he fought in WWI), one nicknamed Hammer my father believes his real name was Lyle Chapman, a set of twins Lillian and Leylan (spelling is iffy); that is all he remembers. Mabel ,married McGinnis, and her son was Dr. Lyle McGinnis, Sr. of Huntington, WV and he had a son Lyle McGinnis, Jr. still living in the area. Mabel and McGinnis also had two daughters named Eloise and Betty McGinnis, if they are still living they would likely have memories of Chapman. My father also remembers there being a large wedding from that side of the family around 1970 or 1971 in Logan, West Virginia. We will look but the chances of us having any photos are slim my fathers mother, Mary Lou, lived in a house that burned down in Hamlin, West Virginia when she was young and as such we have very few photos of her from when she was a child." NARA World War II Army Enlistment Records - Charles H. Chapman, Jr.
. . . It was in this engagement that 2nd Lieutenant Charles H. Chapman of Logan, West Virginia was lost. During the first few hectic minutes of action it was reported that his plane collided with one of the burning enemy bombers. This story was confirmed by [2nd Lt. Charles] Faletta who reported seeing a P-39 climb in the direction of the burning bombers, but saw it no more. . . ."
American Battle Monuments Commission (ABMC) - Charles H. Chapman, Jr.